Part of your strategy for driving direct traffic and bookings to your website may include adding deals and packages to enhance a traveler’s experience, and to entice them to return. 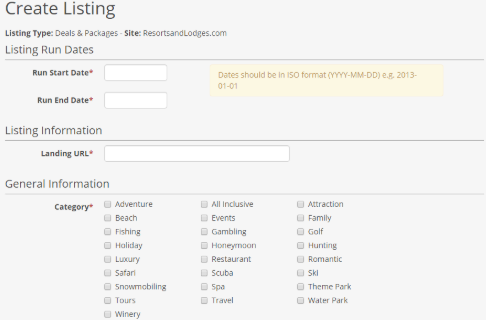 However, you don’t have to limit yourself to adding your deals to your website; you can upload them directly to your ResortsandLodges.com listing so that our travelers can see them as well! The Deals & Packages directories on ResortsandLodges.com are some of the most highly viewed pages on the website. 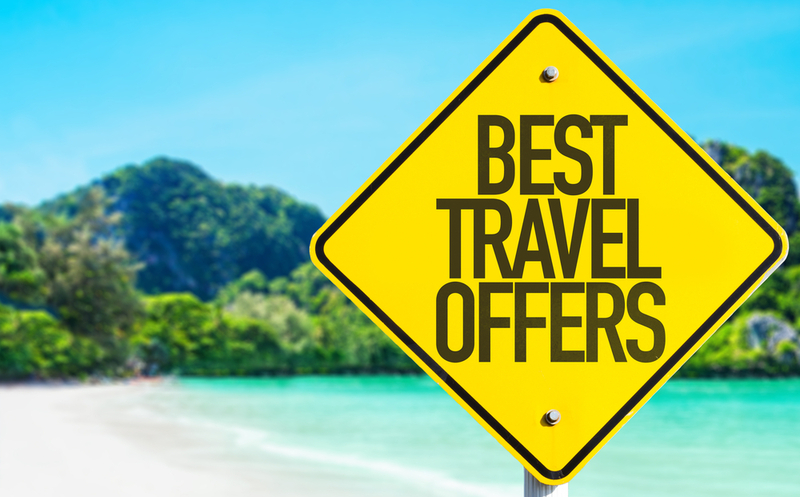 Our travelers are always looking for the best deals, and they know where to find them. Our Deals & Packages are also featured in our Top 20 Deals Newsletters and our Exclusive E-mail Newsletters. If a deal is not uploaded for a property, you won’t have an opportunity to be featured in these great drivers of additional traffic. 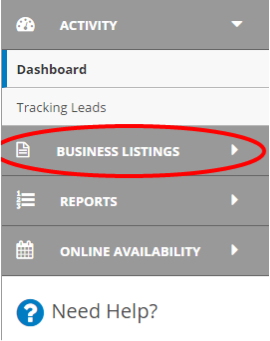 Here is a Step-By-Step Guide to help you get your Deals uploaded to your ResortsandLodges.com business listing today! 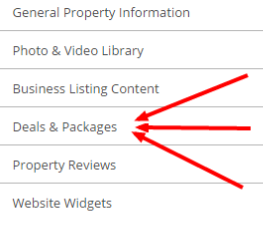 From the screen above, you can click on the blue “Create New +” Button to add your new deal (Make sure to select “Deals & Packages in the Type Dropdown Menu next to the Create New button). Run Dates (Start/End) – The date you’d like this deal to be live on ResortsandLodges.com. Landing URL – This is the URL on your website where we’ll be directing traffic. 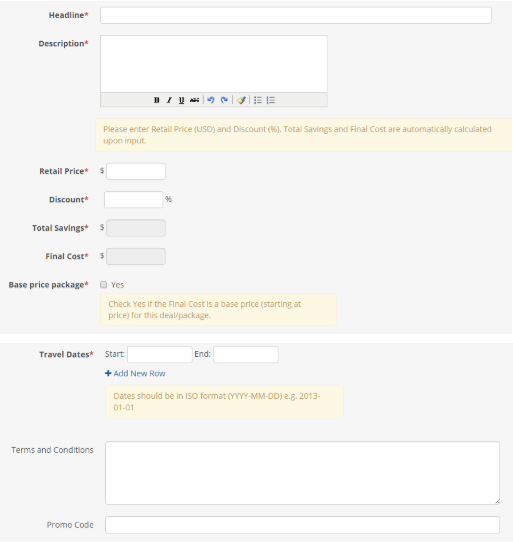 Category – All of the applicable categories/keywords for your deal. Terms and Conditions – Any important information related to this deal. If you have any questions while uploading your offers, please feel free to contact our Support Team at support@resortsandlodges.com.